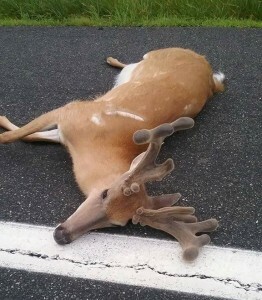 The other day Hunter Waltman of Kiln, Mississippi did what most hunters in Mississippi do this time of year. He and a friend got up early, went to the woods 30 minutes before sunrise, located a turkey gobbling on the roost and moved in and set up. Typical early morning turkey hunt. The gobbler flew down, went silent and never responded to the hunters’ calls. Hens. They sat and waited for 2 hours, and just as they were fixing to leave, they saw a big ball of white fanned out with 3 hens about 80 yards away. A short time later, the hens left the gobbler to nest for the morning, and the white bird made a beeline for the hunters. 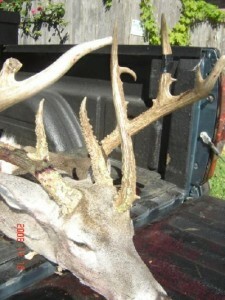 Hunter’s white gobbler weighed 17 pounds and had a 9¼-inch beard (black) and 1-inch spurs (whitish). 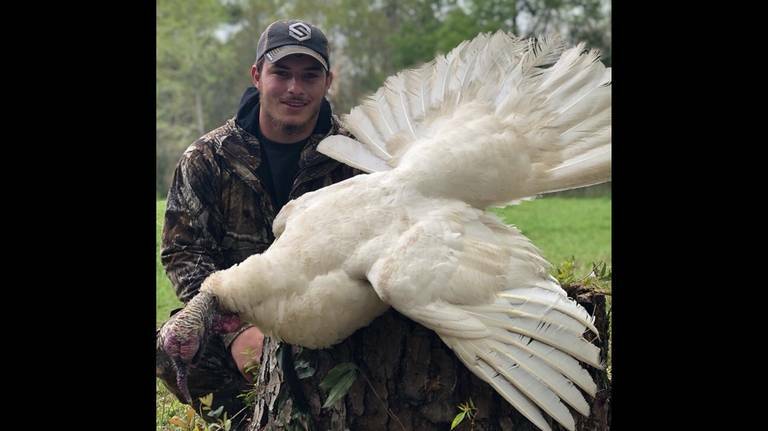 When the first picture of the unusual turkey popped up on Facebook, Hunter’s friends and peers were happy for him and his once in a lifetime kill. But then, a “celebrity” saw it and crashed the party, and the worst in social media came out. It be rare and beautiful so me should kill it. This pea-brained scumbag identifies himself as Hunter Waltman and we should do our best to make sure the rest of his life is a living hell. I can see a rabid anti-hunter like Olbermann, who ceased being funny or clever decades ago, posting a snide Twitter rant about somebody posing with a dead lion or zebra in Africa. But bullying a 22-year-old over a white turkey in Mississippi? “To tell you the truth, it seemed like a threat to me,” (Hunter) told the Clarion Ledger, who has been all over this story from Day 1. There are a few (I emphasize a few) good things about social media. Soon hunters started fighting back, posting that Olbermann’s tweet was not only ridiculous, but it also blatantly violated Twitter’s policy of hatred and threats. ABOUT THE WHITE TURKEY: Let’s get back to what’s really interesting about this story. Was Hunter’s white turkey wild or a cross with a domestic bird? A taxidermist examined it and deemed it 100 percent wild. A wildlife biologist studied the photos and agreed, pointing out that “the naked head and neck do not appear to be as ornate as one would expect in a domestic gobbler.” A domestic bird would be fatter and heavier with shorter legs. The biologist believes the turkey, which had dark eyes like any wild turkey, is partially albino. The Clarion-Ledger contacted Adam Butler, Mississippi’s Wild Turkey Program coordinator, who said he’d never heard of or seen a white wild turkey in the state. In the end, how does Hunter Waltman feel about his hunt for the white turkey, and the subsequent threats from online haters? “Me, personally, I’m happy,” he said. “I’m real excited and they ain’t gonna take that away from me. Well said Hunter, and congrats man. 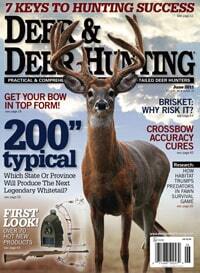 How Will “Bomb Cyclone” and Snowmelt Flooding Affect Deer? The recent bomb cyclone combined with spring snowmelt has swelled some Midwest rivers to record levels and forced the evacuation of hundreds of homes. The governors of Nebraska, Iowa and Wisconsin have declared emergencies. Some of the water-logged areas are bracing for more rain this week. 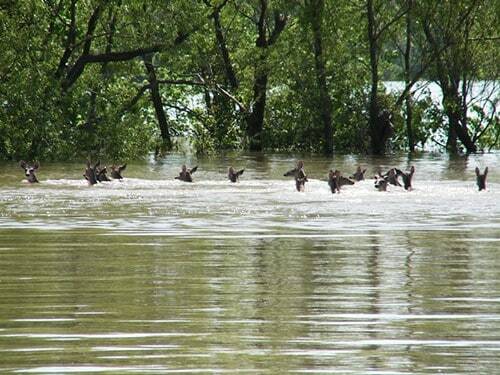 How will all this flooding affect whitetail deer in the region? 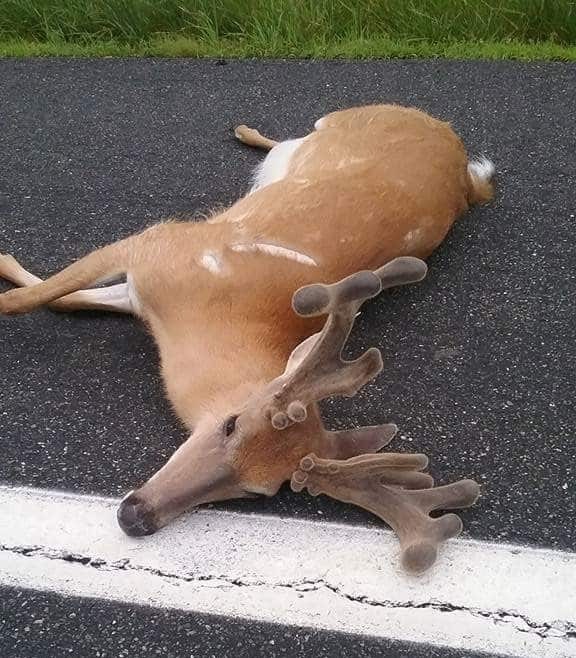 Biologists say that rising floodwaters of river and creeks won’t kill many if any adult deer, though it will displace the animals for days and weeks. 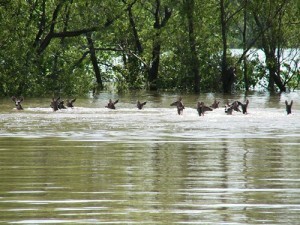 But the deer will eventually filter back into their habitats once the waters recede. Good news is that pregnant does will move out of rising water now and for the next few weeks. The primary concern for deer herds in and around flood zones is later on in May and June, when the does start dropping fawns. One concern, though, is how the current Midwestern flooding might wash away and/or flatten preferred fawning cover for later on this spring. “If does are forced to fawn in fields or woods where there isn’t as much cover as usual, coyote predation on the fawns can increase,” says Grant. The cumulative effects of the bomb cyclone, snowmelt and flooding later on this spring could impact fawning cover in some areas, but that remains to be seen.